Email has become the primary method we use to communicate with others. It is important to make sure the emails you send are received by the other party. Spam (unwanted email) is a big problem and has made the process of making sure your email is received a bit more complicated. Many tools help manage and block unwanted email from your inbox. Most agencies have some type of spam filter on their incoming email. So do your customers. Your incoming emails could be considered unwanted spam by your customer’s spam filter. Practicing proper email etiquette is one way to help make sure your emails are received in your customer’s inbox. Another is providing instructions to your clients on how to “whitelist” your emails with their Internet Service Provider (ISP) to make sure they are received. Whitelisting is the simple process of your client telling their email service provider that they do want to receive emails from you. The complication is that every email provider has a different method by which the user whitelists your incoming email address. There are several opportunities, especially at the start of an email relationship, to encourage your clients to whitelist. This can be on the sign-up form, thank you page or in a welcome message. 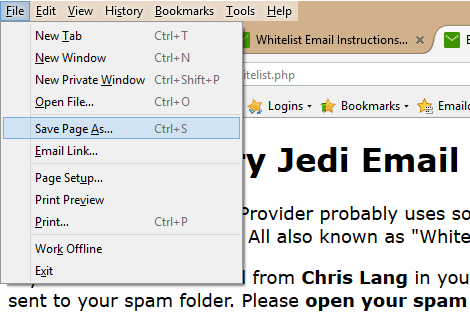 I have discovered a free website – Email Delivery Jedi – that helps you create whitelist instructions for virtually any email service your customer uses. To create your customized whitelist instructions, just complete a form on the site with your email information and click the “Create My Whitelist” button. The site says that none of your information is recorded or maintained anywhere. Providing whitelisting instructions to new email subscribers is one way to make sure your emails are received. What steps do you take to improve your email delivery? Let me know.